A laptop computer is a portable personal computer powered by a battery, or an AC cord plugged into an electrical outlet, which is also used to charge the battery. Laptops have an attached keyboard and a touchpad, trackball, or isometric joystick used for navigation. A laptop also has a thin display screen that is attached and can be folded flat for transport. A laptop computer is smaller than a desktop computer, generally less than three inches thick, and weigh less than desktop computers, usually less than five pounds. The laptop's size makes it convenient for transportation in briefcases, backpacks and other bags. It derives its "laptop" name from its easy use by resting on a person's lap while sitting without the need of a desk or other surface. Laptop computers may also be referred to as notebook computers, though a notebook computer usually describes a computer that is smaller and lighter than a traditional laptop computer. Laptop computers can be used at a desk and can be used similarly as a desktop style computer by connecting a separate monitor, keyboard, and mouse. Docking stations are devices that allow some laptop computers to easily connect to peripherals like monitors and keyboards in an office setting, and then "undock" for easy mobile use and transport. Laptops have ports and other interfaces similar to desktop computers, such as USB ports, network interface cards, audio speakers, digital media drives and memory card slots (such as SD card readers), which are often built into the laptop computer by the manufacturer. Additional peripherals may be connected to a laptop computer through available expansion slots, through USB or serial ports or wirelessly via a Bluetooth connection. Laptops have several ways of connecting to networks. A wireless connection, or WiFi, is the most common means of connecting a laptop. Laptops may also have ethernet ports that allow the computer to connect to a local area network (LAN) through an ethernet cable. A Bluetooth connection is another means for a computer to communicate with devices or other computers. For example, a Bluetooth mouse or keyboard can be connected wirelessly to a laptop. 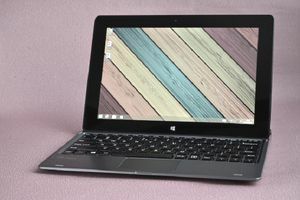 A laptop can also connect to a smartphone via Bluetooth (this connection may also be made via USB port and cable) to access the Internet over the phone's mobile network. This is commonly referred to as "tethering." As technology has advanced, the size of portable computers has gotten smaller. Portable computers became laptop computers, and laptop computers have become known as notebook computers. Ultraportable or subnotebook computers can be smaller and lighter computers than notebooks, though these names tend to be manufacturer labels that vary and have no specific and broadly accepted specifications that formally define these categories. Netbooks appeared on the market in 2008. They are small and light, and during their heyday were less expensive than laptops; however prices of laptops have fallen, and netbooks have generally faded to be replaced by tablets, such as the Apple iPad and Microsoft Surface.